This fortnight Patter gave us the word "Hands" for our artwork and choice of scripture. Just the day before I received Patter's challenge for this fortnight I had been singing along to the song " Our Lives Are in Your Hands" by Chuck Girard on a cassette in our car. This is the song I used in my wedding to walk down the aisle to. So I have used the chorus from this song on my art and a Bible verse I thought very appropriate with the thoughts of Jesus Death and Resurrection being celebrated this month. I know that as Christians we celebrate this all the time but it is good to have this special time of the year to do so more fervently. 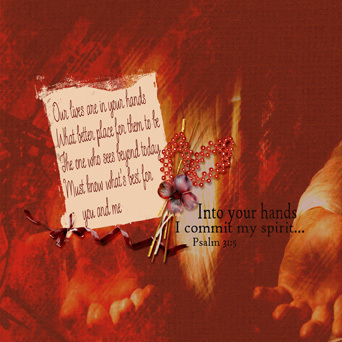 For my digital art I used a kit called Supreme Love by Feli & Chocolate Geranium Digital Designs; mask by Coffee Shop; image from Worship House Media.